St. Patrick’s Day is only 10 days away, but there’s still time to prepare to celebrate all things Irish. Many legends surround St. Patrick; one being that he drove all the snakes from Ireland. Historians have found that snakes were never native to Ireland, so some think this is a metaphor for the conversion of the pagans by St. Patrick. He is also attributed with introducing the Celtic cross. Some of the Irish pagans worshiped the sun, so legend has it that Patrick combined the Christian cross with the circular pattern of the sun as a way to associate light and life with the Christian cross in the minds of his converts. It has also been suggested that by superimposing the symbol of the cross over the symbol of the sun, St. Patrick illustrated the supremacy of Christ over the pagans’ sun god. 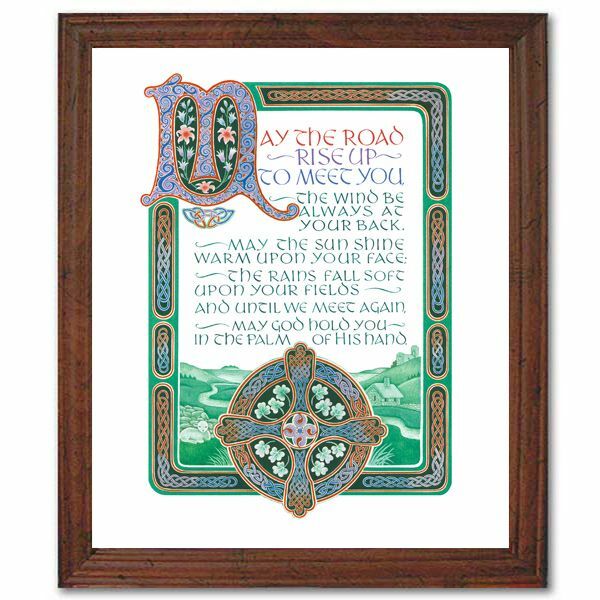 This entry was posted in St. Patrick's Day and tagged Christian products, Christian wall art, The Printery House on March 6, 2015 by Printery House. Summer is winding down and that means that many college-age students are starting to pack up for another semester away from home – some of them for the very first time. Family and friends often want to send those young academics off with a little gift to remind them of home. The trick is finding a gift that is right for a student with limited space in a dorm room. For Christian families, it will be just as important to send young students off with a reminder of their faith as it is to give them a gift that says “home”. Fortunately, there are more Christian products than ever from which you can choose. One fun idea is to put together a college survival kit. Your kit can contain all sorts of small presents that will mean the most to your college student. A home blend of coffee and a coffee mug with a scripture verse are great for those early morning classes or late night study sessions. Your kit might include some of mom’s homemade brownies to share with new dorm-mates or favorite fun-size candies. A small daily devotional is another great idea for kids who will have plenty of school reading to put away each week. Family members might decide to go through the same devotional so that they are able to “share” the experience with the child far away. A small plaque with a bible verse that sits on an easel or hangs near the door can be a simple reminder that life is more than quarterly exams and GPAs. Lots of students find it fun to decorate their own “away from home” space – but reminders of the faith that has brought them this far can still be a part of that new identity. Most young people post their pictures on social media these days, but it can still be a good idea to tuck a small photo album inside your survival kit. Someday they will want to be able to flip through their college years and walk down memory lane. Other Christian products worth a spot in the kit include favorite music CDs, a Christian key ring, faith-based jewelry like a cross necklace or a pocket medallion or small journals and plenty of pens. Female students might enjoy a small figurine like a Willow Tree angel – there is even an Angel of Learning which would be right at home nestled on a dorm room windowsill. If you are preparing to bid a college student farewell, grab some Christian products and put together your own survival kit soon. When you do, check out the products we offer at The Printery House – an online Christian gift store with many items perfect for your collection. This entry was posted in Christian Products and tagged Christian gifts, Christian products, college gifts, gifts for college students, The Printery House on August 5, 2014 by admin. Those in the older generation (and maybe some of the newer) know what a gift drawer is, and how useful it can be. It’s the practice of picking up gift items here and there, as well as cards, and keeping them in one easy-to-find spot for when you need to send someone a quick token of appreciation or mark an occasion. Gift drawers may be seeing resurgence in popularity lately for a few reasons, such as the convenience of online ordering with quick or free shipping, and new visual mediums showing all the options that are available. The premise, however, is the same no matter how you order the items – being ready for taking advantage of a special gift-giving opportunity. If you’re Christian, you likely have friends, family members, teacher and coworkers who share your faith. Your well-stocked gift drawer with great Christian products can add meaning (while still being convenient) as you surprise these special people with the occasional gift. 2. Candles are always a great choice. Keep a selection of candles handy in your gift drawer. Some come with customized candle holders and they’re always an appropriate gift year-round. Throw in a few gift bags and some tissue paper, and you’re ready when an opportunity arises. 3. Coffee, anyone? Most people still enjoy a good cup of joe, or hot chocolate, or tea…so keeping a few inspiring mugs in your gift drawer means you’re able to share your thoughts easily. Put a small gift card inside to a favorite coffee house and it’s done. You could even throw in a favorite verse or two on a notecard inside the mug. 4. A hand-held cross is always appreciated. A hand-held cross, such as the popular wooden Comfort Cross, is always a great gift – and especially for someone going through a difficult time. These crosses are used during prayer, meditation, walking and almost anywhere because they fit in a pocket or a purse. 5. Can a great card also be a great gift? The answer is yes. A selection of tasteful religious greeting cards gives you a chance to write a powerful message or a simple “thinking of you” at a moment’s notice. Many people may eventually share a gift or shelve it, but a special note inside a card will be treasured for years. If you choose a card that also has a special story behind it, such as those made by the monks and artists at The Printery House, the card is even more unique. This entry was posted in Christian Products and tagged Christian products, Christian wall art, coffee mugs, gift drawer, religious gifts, The Printery House, wooden crosses on July 15, 2014 by admin.